A few weeks ago I saw one blogger reviewing the new Illuminated Bible which originated in Sweden and is "coming to America in the Fall of 2008!" I read the review because I wanted to know exactly what the illuminated version of the Bible was supposed to be like. The picture made me think of Meyer's Twilight series and so I was not expecting to be wow-ed by the review that I read. But I was wow-ed. Just not in the way that I expected. So, really, what is this? A gimmick? A marketing scheme? The review that I read of it assumed that this was published/produced by a Christian who wanted to make the Bible more approachable by today's modern society. 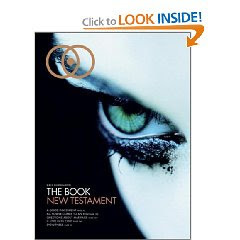 This particular Bible has the feel and is created much like the glossy magazines that you see on news shelves. You'd likely find this one next to the Digitial Photography sections of the magazine rack. Or Cosmopolitan. Or People. Or something worse, I don't know. I only know you wouldn't be finding the Bible where you'd want to find it or might normally expect to see it. It's definitely . . . unique, shall we say? In other words, this is an up and coming fad that won't be going away any time soon. In fact, Americans will now have the pleasure of viewing and responding to the Illuminated Bible for themselves, as it is hitting the bookshelves even as I type. Again I would ask people to stop and think for a moment. The insides of this magazine (I hesitate to call it a Bible at all) are filled with images that will shock most Christians. If you aren't a Christian and you pick up this Bible, the chances of you understanding the point of Scripture is on the slim side of things. It is filled with running text (as opposed to verses), and is altered in ways to be "relevant to today's society." Furthermore, the Christians that I have discovered to be already talking about this book (because of their advanced review copies having been received and perused) are talking about it as if it is a tool to help make the Bible itself seem more relevant to today's non-Christian. It could be used as a tool for evangelism, right? That's the argument. But can it? Well, let's stop for a minute and find out a little bit more about it. I would encourage you to go to two website locations to find out more about this Bible. The first place, American's Happy Playground (and mine! ), is Amazon.com. What is the goal of publishing The Book? There is no religious mission behind The Book. We believe that its success will be driven by the fact that this is not coming from any specific faith, religion or church. We are from many faiths, backgrounds, and beliefs; ultimately we are trying to create something for the many and not just for the few. The goal is to drive an emotional reaction and get people to think, discuss and share. It's meant to trigger bigger moral questions that will in turn help people to understand the common heritage between all religions through the Bible's text. We hope people will find the images, design and layout intriguing—intriguing enough to talk about the actual stories in the Bible and what the morals and lessons mean to them. The more you know, the more you can participate in discussions about the world and understand the bigger picture. Since this was Amazon's marketing plan for selling this book, I decided that I should probably go straight to the Official website for the Illuminated World. It is there that I viewed an carefully marketed advertising video of the book itself (images of its insides included!) and an interview of its creator, Dag Soderberg. Go check it out. World seeks to introduce today’s audience to a revolutionary contemporary Bible, one that encourages dialogue and is culturally relevant, accessible and easily digestible for any reader regardless of religious, economic, racial or social background. In reading those two statements I do not walk away with the opinion that the creators of this book have any idea of drawing people to Christ (which, after all, is the point of The Bible). I get the distinct impression that it's all about marketing . . . and other things. Yes, it is very true that Soderberg said that he wants to make the Bible more relevant to the people of today. But he follows up that statement by saying that he doesn't necessarily support Christianity. That's not his primary goal nor is it the primary function of this book to do so. This book does not exist with the purposed intent to draw people to Christ. So to anyone who might think that new and different shocking things might somehow and sometimes be of benefit to the modern human, Soderberg himself steps away from the idea that it's an evangelism tool. No, it's a marketing tool. His main arguments for it talk about profits and sales in Sweden and now, glory be!, the American market is open to him. Yay. More important than what people find acceptable or endearing, is what scripture has to say about The Word of God -- how it is to be treated, how it is to be received, believed, handled, perceived and paid attention to. God's Word is sufficient if you want to believe it. It's living; it is not dead. It is powerful, open and accessible. 2 Samuel 7:28 - "And now, O Lord God, you are God, and your words are true, and you have promised this good thing to your servant." Or has he spoken, and will he not fulfill it?" We find a consistent Scriptural witness that God does not lie, for He is incapable of telling falsehood. The men who wrote God's words, had supreme confidence in the rest of His words. If God is incapable of telling a lie, it stands that the words He spoke to those who wrote the words of Scripture must also be perfectly true. At this point, I trust we have sufficient Scriptural basis to conclude that Scripture is authoritative and that the words given by God to men were without error. But how can we know that the words we have today accurately represent those words? In short, my response to the Illuminated Bible is to say that it should not be. We should not welcome it as an evangelistic tool, if only for the reason that it isn't being created with that intent. We should not welcome it as truth that is in any way complete, again because it does not claim to be complete. It is not claiming to be anything other than a book of disarming pictures displaying sometimes shocking and disturbing images. It is a marketing fad. It is partial truth at best and it fights against truth at worst. Therefore I believe the only response to have to welcoming this book to the world is to say, "No thanks!" We do not need it because we have the Word of God which is perfect, God-breathed, faultless and pure. Nothing needs to be added to it and nothing taken away. This is another case where we can clearly see that God is perfect and we are not. When we take the Words which we have been given and try to make something else out of them, or birth something out of them that we were not in a position to give birth to, then we fail to safeguard the Word which has been entrusted to us. Guard it. Now it's your turn. I received this for review, and I disagree that the book should be dismissed. I never saw this an "evangelistic" tool but rather as an interpretive piece of work. Not the same as the Bible you read for your devotions, but perhaps worth a look. We all interpret the Bible. If we suggest otherwise we are simply not being honest with ourselves. The Bible has been translated into English many times and each translation carries with it the weight of interpretation. I'm with you on this one, Carrie. I don't understand the need for people to repackage the Bible in a way that is "relevant to modern society" and "encourages dialogue." That sounds suspiciously like "making it palatable to modern tastes" and "encouraging the attitude of entitlement that pervades our world." Thanks, but no thanks. The Bible remains powerfully relevant in its most faithful translations, and all a book like this "Illuminated" Bible does is put a little more distance between the sinner and the recognition of his sin. I actually don't have a real big problem with various translations of the Bible. I'm not a King James Version thumpin' Bible believer. What I DO take issue with is the fact that the creator of The Bible Illuminated is not making any attempt to stay true to scripture whatsoever. In the other translations you might see (American Standard, NIV, KJV, etc) they are trying to translate the Bible and stay true to the truth and the message. Illuminated makes no such claims towards accuracy. At all. In fact, the creator has stated just the opposite. It's definitely not something I would pick up for a devotion, no . . . I LOVE amazon.com. Yes, it is a happy playground. I know nothing of this book, but I will humbly correct you on the cover. It does look almost exactly like Stephanie Meyer's The Host, which is not part of the Twilight series, but that's a good call, and I wonder why? And will the stalking never end?? You girls need to start a fan club, LOL. Did you read my "first thoughts" and my review? It bothers me that the message is expanded upon by adding in United Nations mission and pushing certain political and social issues. my first thoughts after the online preview can be linked to at the bottom of that review. I also got brave and published my review on Amazon. I bet I'll be flamed and criticized. Oh well. So far there are only 5 customer reviews on Amazon which is suprising to me. How does a quote from the Bible rebuke the folks that say humans wrote it, not God? The people that make that argument are suggesting that humanity isn't always pure and, with ill-intent or not, have misconstrued facts. So, they would (quite easily) counter your quote from Timothy and say it is just another example. You may believe that God doesn't lie, but history has proven that humans are quite capable.